(ABOVE) My 2018 planner and cover are just as pretty and feminine as what I chose last year, only this time the colors are understated and muted. 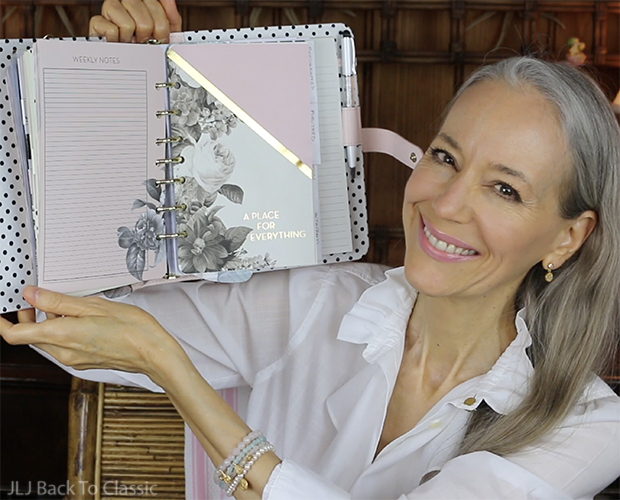 I am so excited to be showing you my 2018 planner-calendar and cover. 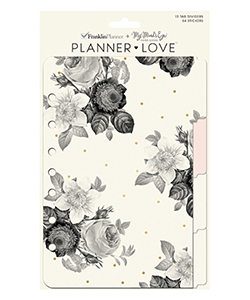 This is the third year I’ve chosen a set from the Franklin Covey Planner Love series, because I’m a big fan of their pretty, feminine, and varied color and pattern choices. Also, even though my planner is faux leather (they were the last two years as well), the quality is lovely. I am thrilled with all of them. I also found a variety of inserts and accessories from other companies to complete my setup. I hope you enjoy seeing them all. Thank you again for taking the time to visit my blog! 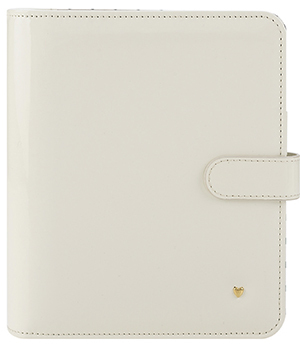 (ABOVE & BELOW) Franklin Covey Planner Love Classic Snap Binder (other colors available; see below). 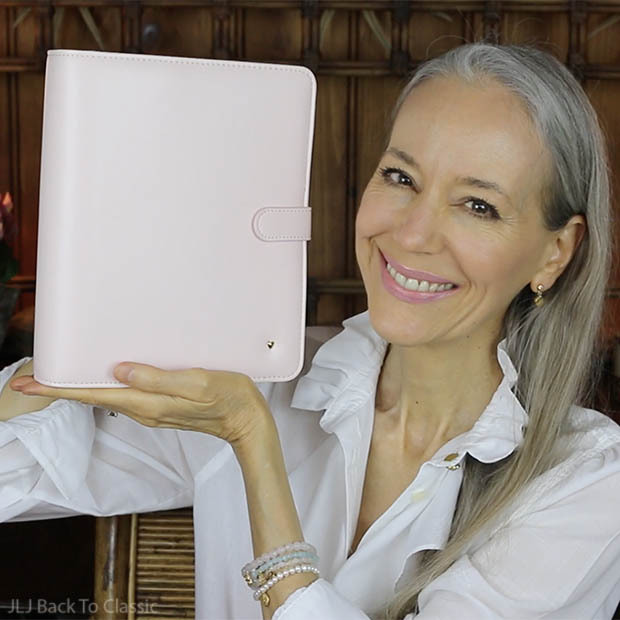 My binder is in the color blush, is faux leather, and is available in two sizes: Classic, which is what I have (5.5″ x 8.5″), and Compact (4.25″ x 6.75″). It also comes in a wire-bound version. 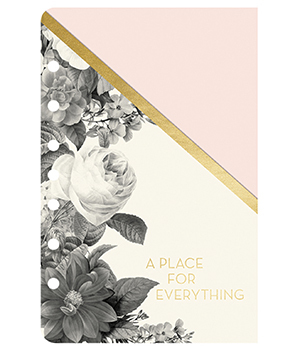 I continually return to FC’s Planner Love binders because of their feminine colors, the gold rings and hardware, and the quality. 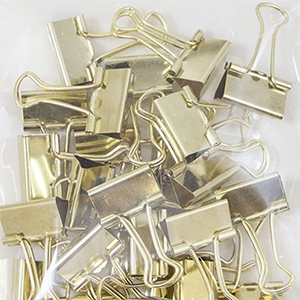 This year, the company replaced their magnetic closure with a gold-hardware snap closure. Both versions are available (magnetic version is more limited) and I, personally, like either one. 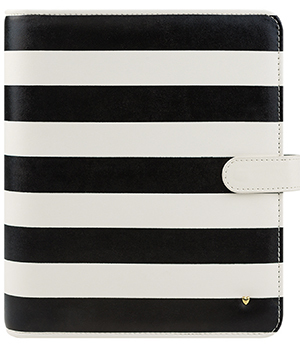 I prefer the ring binders, because I like to customize my planners with a variety of inserts and note paper. 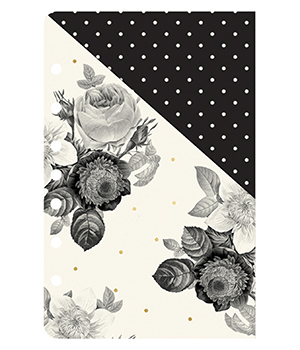 (ABOVE & BELOW) Black Pilot G-2 07 Gel-Ink Pen, White Crystal-Filled Ballpoint Pen (Set of 2), and Franklin Covey Blush Florals and Gold Magnet Clips (set of 6). 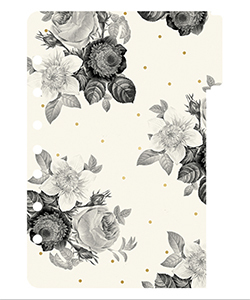 (ABOVE & BELOW) Franklin Covey Blush Florals Pocket Dividers (Set of 4) and soon-to-come! 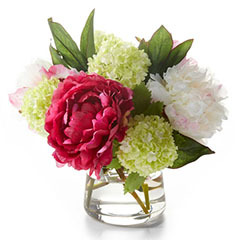 Franklin Covey Blush Florals Tab Dividers (Set of 12). 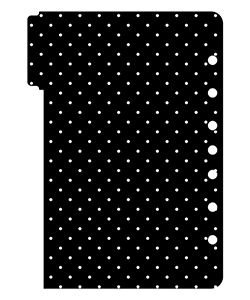 Every year I order a set of 12 tab dividers and a set of four pocket dividers for my planner. This year, however, for some reason I neglected to order the tab dividers (but they are on the way), so for the purpose of this video I made do with homemade tab dividers. I didn’t want to take a chance of them selling out before I could tell you about them! 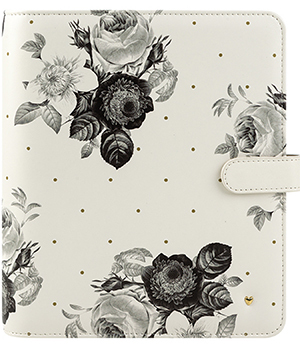 I need the tab dividers, because the planner doesn’t come with them. I use them to mark my nine working categories in the back of my binder, as well as three months of my planner (the remaining months of the planner are kept in a storage binder). 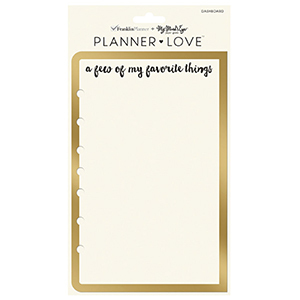 I place one pocket divider in front of each of my three planner months and the fourth in front of my working section of nine categories (to store invitations or notices of upcoming events or any other loose papers). They’re so handy and pretty. 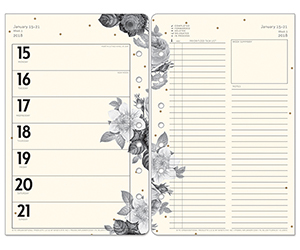 (ABOVE & BELOW) Franklin Covey Blush Florals Ring-Bound Weekly Planner. 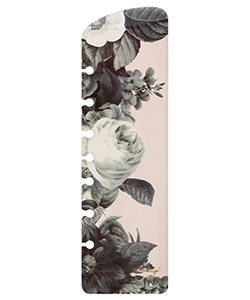 (ABOVE) Franklin Covey Blush Florals Ring-Bound-Page Finder. 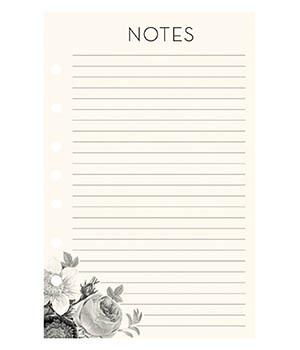 The pages of the planner are a soft, soothing ivory, and each month has a different design. Several months (including March, shown below) also have blush pages. The page finder (shown above) comes with the planner, but I bought an extra one to be able to also quickly flip to another section of my planner. The reason I keep choosing this style of planner is because I prefer a weekly layout. 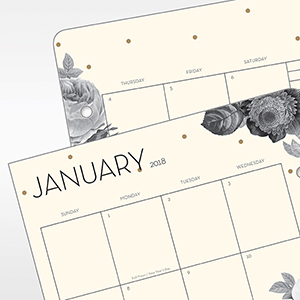 This one also offers a month at a glance before the beginning of each month–which I so need. I like to be able to see the entire month in front of me, so I know which weeks are full or filling up and which ones are free. This helps me better schedule each week and keep my life more balanced. 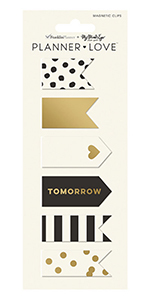 (ABOVE & BELOW) Kate Spade Gold Foil Sticky Note Set and MultiBey Gold Sticky Note Set. 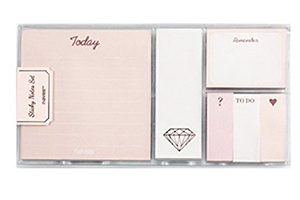 I specifically searched for sticky notes in the colors of ivory, white, and blush with gold foil and was thrilled to locate these. I placed several in my binder and left the others in their respective containers. 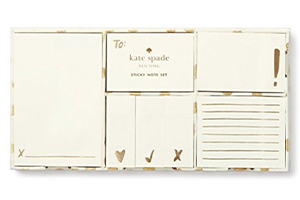 The Kate Spade set is gold foil on an ivory paper, and the laminated-cardboard storage container is adorable with its gold-foil leopard spots. 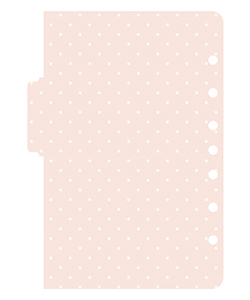 The MultiBey set is in the colors of pink and peach blushes with gold foil on white paper. This storage container is hard plastic, so will last for ages. Love how pretty they all look in both my planner and in their storage containers. 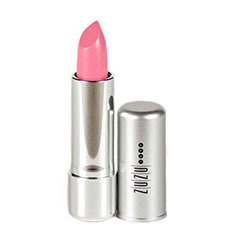 Also, they’d make adorable gifts for a girly girl. (ABOVE & BELOW) Franklin Covey “A Few of My Favorite Things” Dashboard and similar washi tape here, here. I discovered this invention called a dashboard about two years ago. 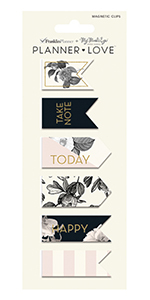 It’s a laminated, firm cardboard insert that is perfect for attaching sticky notes or inspirational cards and other fun ephemera. 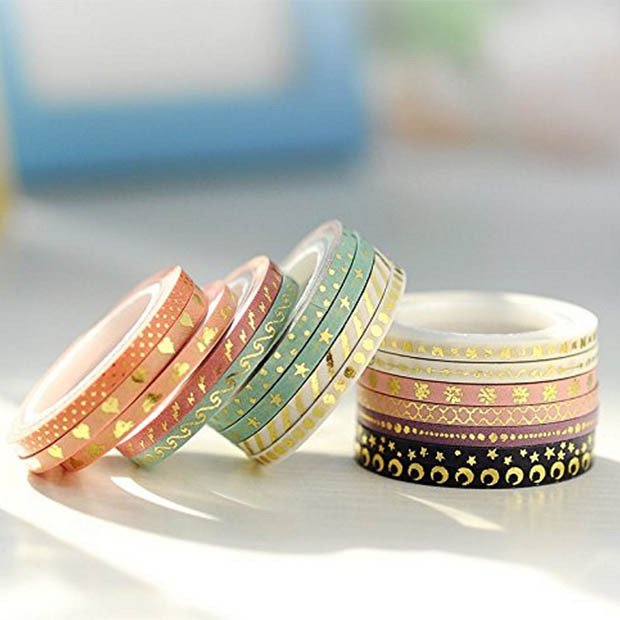 I use washi tape, below, which is a pretty and repositionable tape, to attach items that aren’t stickable otherwise. 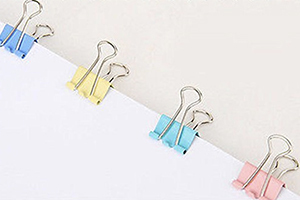 (ABOVE & BELOW) Franklin Covey Plastic Inserts Value Pack (set of 5), similar Gold Small Binder Clips, similar Pastel Small Binder Clips, and Crystal-Filled Ballpoint Pen (set of 2). 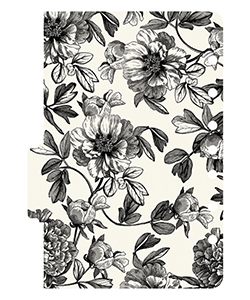 This set of five inserts is wonderful for corralling so many pretty and useful things. 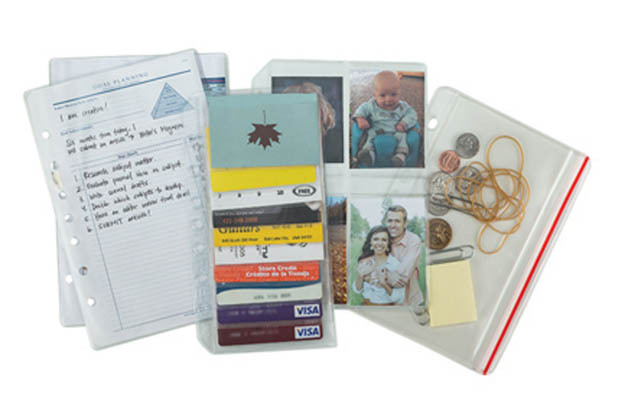 I use the zipper pouch for storing clips, washi tape, ephemera, extra pens and stickers, and the sleeves for displaying personal photographs and inspiring pictures from catalogs and magazines. 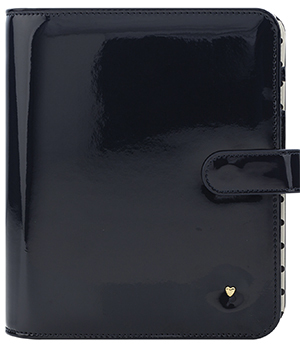 (ABOVE) Franklin Covey Storage Binder-Case. 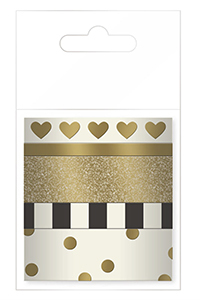 (ABOVE) Scotch Removable Magic Tape (.5 inches x 36 yards; without dispenser). I ordered the tape without a dispenser and simply placed it in a regular Scotch tape dispenser I already had. 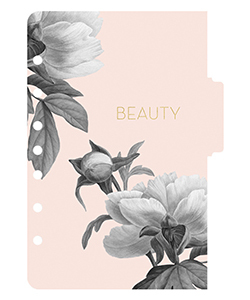 (ABOVE & BELOW) Franklin Covey Planner Love Blush Florals Notepad. 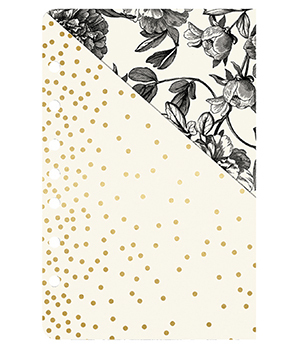 Although my planner did come with several lined pages with pretty, coordinating patterns on them, I also bought a lined notepad to keep in the back of my binder for quick and easy access. 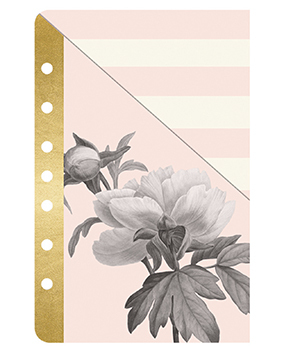 On the front of each page is this floral pattern, while on the back are pink stripes down the spine of the page. 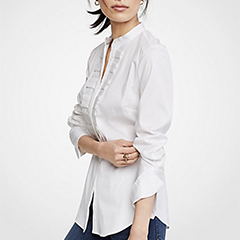 TOP: Ralph Lauren Ruffle Blouse, Old (Alternative Ann Taylor). EARRINGS: Satya, Old / BRACELETS: Satya Pearl and Semi-Precious Stone Stretch Bracelets. 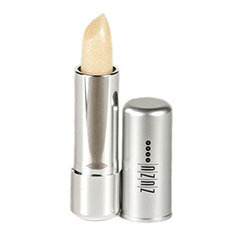 FACE MOISTURIZER: Nourish Organic Face Lotion / LIPS-EYE AREA MOISTURIZER: Nourish Organic Shea Butter (under eyes, top of cheekbone) / FACE MAKEUP: Zuzu Gluten-Free Dual Powder Foundation D-7 and D-24 (applied with BareMinerals Flawless Application Face Brush; also available here) / CHEEKS: Gabriel Apricot Powder Blush, applied with EcoTools Cruelty-Free Stippling Brush / LIPS: Zuzu Luxe Dollhouse Pink Lipstick and Zuzu Luxe Uber Lipstick / EYES: Gabriel Charcoal Eyeshadow (applied with brushes from EcoTools Cruelty-Free Six-Piece Eye Set) / LASHES: Pacifica Aquarian Gaze Water-Resistant Mascara in Abyss. (Some links in this post are affiliates. More information here.) Note: 100% Pure Also Here: 100% Pure Europe, 100% Pure UK, 100% Pure Canada. Always super excited when i see your mail has arrived. Thank you so much for such awesome information. To be organised just makes life less stressfull less complicated. Love your choice of colours always . always soft which is never tiring. Your blouse looked stylish & cool. Beautiful make up. Thank you for always making life look as beautiful as you are always. something right because you look wonderful. I enjoy your cool, calm and collected presentations very much. THANK YOU !! 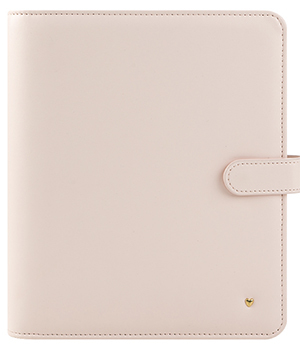 My Franklin planner inserts are the same blush style weekly in the compact size, I am using an older microfiber style zipper cover with mesh pockets and a handle with a strap much like a small messenger bag. Franklin offered this a long time ago. You asked about lined color pages. 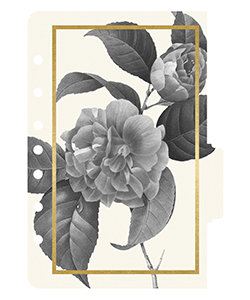 I have found the Franklin BLOOMS lined pages look nice with the blush pages. Classic # 6 7 7 2 0 50 lined pages for $ 5.95. Franklin used to offer packs of different color pages but I am not sure they still have this option. 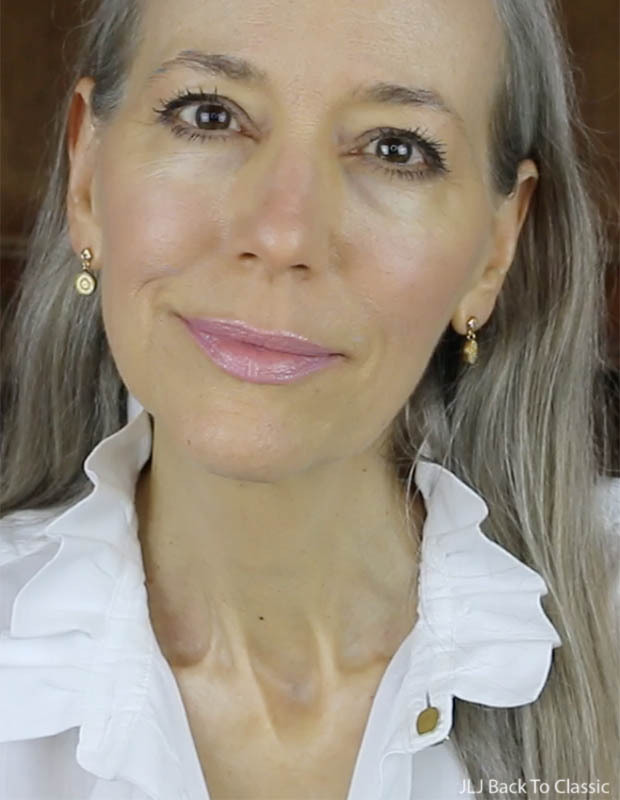 Just today discovered your blog and am thrilled to “meet” you! Was thinking as I read a few posts that (although I’m older, 64) we’re kindred spirits. 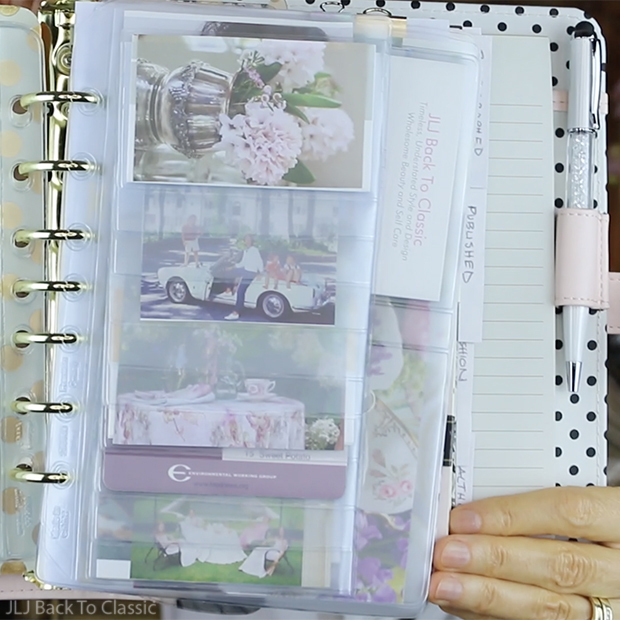 Then I read this post and saw that we use exactly the same planner! 🙂 I’ll be back often for inspiration! Thank you!